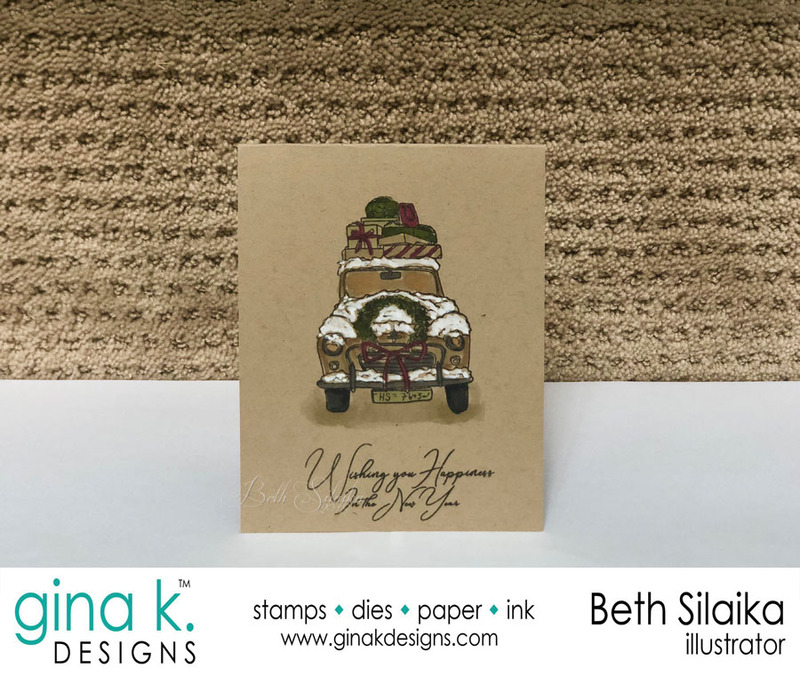 Welcome to day two of the Gina K. Designs New Release Blog Hop. Today I will be showing you some of the samples I created with my latest stamp set. I am showing Emily’s stamp set, but do not have any samples because we did not get it in time! It is super cute and perfect for Valentine’s Day! There is also a super cute incentive set which if free with a $75 purchase! Who doesn’t like free? Here is Emily’s lovely set – which is now available at Gina K. Designs! This is my latest set! All Star is available for purchase now at Gina K. Designs! Sometimes when I create a stamp set, I just know it is going to be fun to stamp with it! This set is so versatile – you can use it for everything from The 4th of July to Baby Cards. The set can be used for Holidays and for backgrounds, for teacher and coach cards and birthday celebrations! This first clean and simple card uses Wild Dandelion and Jelly Bean Green. I added a few sparkly gems and used the sentiment from the set Sweet Friendship. This card uses innocent pink and amalgam black inks on the background and white pigment ink on the black sentiment block. I love experimenting with kraft paper and different color inks. I used the white pigment ink right on the kraft with the open star. I colored in the stars with spectrum noir markers in a variety of colors. The sentiment is stamped in white pigment ink on Gina K. black card stock. There is a small gem attached to the sentiment strip. Another Kraft creation with white pigment ink! This was done using the speckled strip from Lisa’s Today And Always set followed by adding some of the solid stars from the All Star set. Make A Wish stamped in black amalgam ink. Wild Dandelion, Ocean Mist and Black Amalgam ink were used in the creation of this super cute, 2 minute card. This card uses a jelly bean A2 base. The stars are stamped in Jelly Bean, In The Navy and Ocean Mist. This first one is so simple – just randomly stamping the stars in amalgam black ink and then adding the sentiment. This sentiment is from Sweet Friendship. I used a pale turquoise spectrum noir marker to color in the larger stars. This card features a square innocent pink base with a mix of stars from All Star stamped in moonlit fog and innocent pink inks. The sentiment from Sweet Friendship is stamped in black amalgam ink. This last All Star sample features a bubblgum pink A2 base. The stars are stamped in sweet mango, bubblegum pink, jelly bean green and ocean mist. The sentiment is stamped in black amalgam ink. I used some cute bakers twine to finish off the card. Did I overload you with samples? This is such a great set, it is sure to sit on my desk for many months! To be eligible for a change to win another $50 Gift Certificate, stop by all the blogs, leave a comment and you may win! Here is the list of designers who are featuring beautiful creations with my & Emily’s latest sets! Winner will be drawn on Friday! Happy New Year! 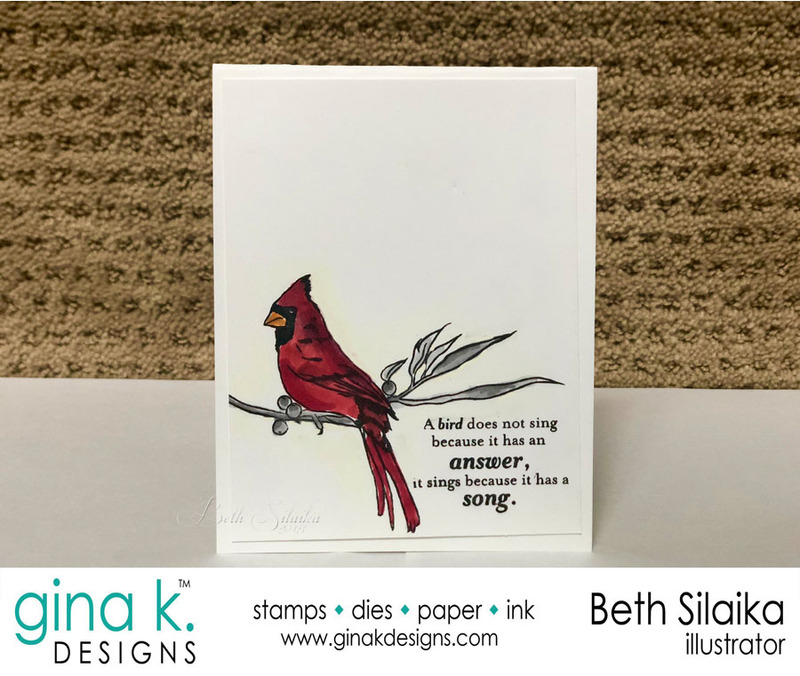 Welcome to the first Gina K. Designs Release of 2019! Today we are showing off two of the new sets: Open Book by Melanie Meunchinger and Today and Always by Lisa Hetrick. If you missed it, there was a Gina K. Facebook Live Release Party which featured the Illustrators and these sets. It was pretty fun to see & hear the ladies I work with (I have never met them in real life, so it was the next best thing). Here is a LINK to the Facebook Live replay in case you missed it! Today I am showing a few cards that I made with Melanie & Lisa’s new sets! This would be a great card for my sister or sister-in-law! They are both librarians! It would also make a great card for inserting a book store gift certificate! It would make a great card for your favorite bibliophile! This second card is perfect for anyone who loves crafts! I used the pencil stamp and colored it and then stamped the I ❤ Crafts along the bottom with inks that coordinated with the pencil colors. Lisa’s new set features this amazing spatter pattern, flowers and the fun sentiments. I chose to use Make Today Amazing with Moonlit Fog on innocent pink. Such a great combo! I used a little twine to finish the card. Love how the sentiments can me mixed and matched. Since Today is so huge I was able to put make sideways! I was playing around with a scrap of paper and some of the beautiful Gina K. inks in purples. I never play with purple, but I created this background with sponge daubers and stamped the stars from my set with Gina K. white ink. The sentiment went with it perfectly and mounted on a white A2 base, it looks clean & beautiful! Now I am not going to tell you what to do, but if I wanted to have a chance to win a $50 gift card for something on my Gina K. wishlist, I would hop around and leave a comment on all the blogs! You can start here by telling me that you enjoyed these cards and that you Pinky-Promise that you will stop by tomorrow to see my new stamp set and all the beautiful creations which our design team made with them! Thanks for hopping by! Please stop back again tomorrow for TONS of new creations! The birds are quite easy to color! This was stamped in the Gina K. Black amalgam ink and colored with copics. This card features a cherry red base stamped with the black amalgam ink. I used the black and white bakers twine for the top of the card. Finally I colored the stamped sentiment with copics to give it some depth! What do you think of the cards today? Leave a comment below, then stop by and see what the other designers have created! You will be in the running for a $50 gift certificate! A new FreckledAndFun Blog Location! I will be moving my blog over from Blogger to this new site. Thank you for your patience! 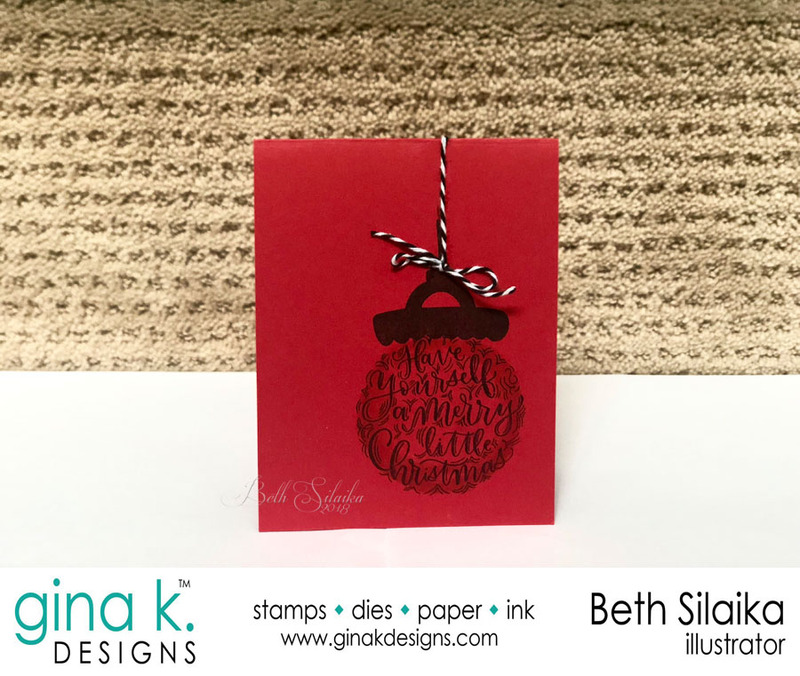 Author freckledandfunPosted on November 5, 2018 November 5, 2018 Tags Cards, Clean and Simple, Gina K. Designs, Stamping20 Comments on A new FreckledAndFun Blog Location! The first set is by Gina and it features some adorable MINI images that have coordinating sentiments. Might I even call them MICRO images. They are adorable. Almost as adorable as new puppies. 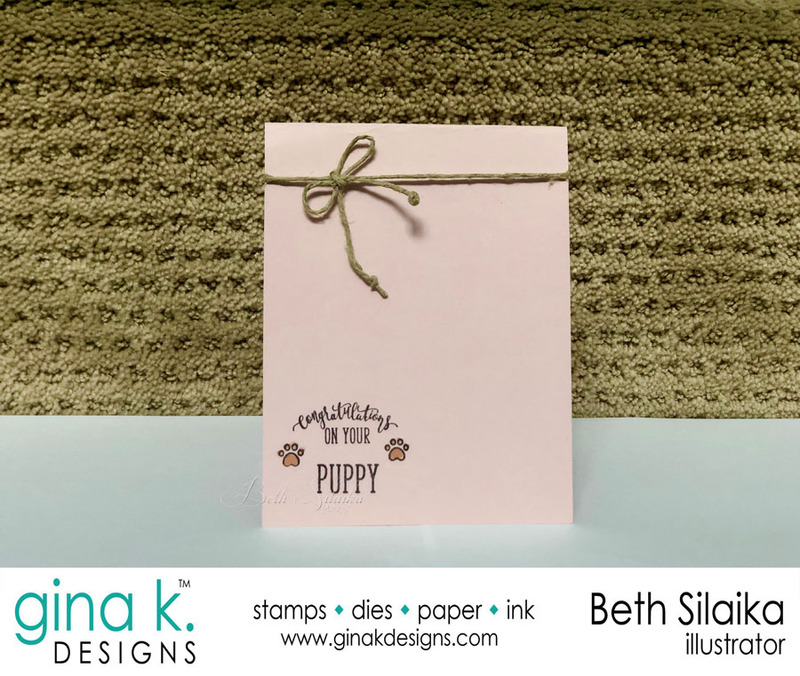 I have had two friends get puppies this past month, so I used this release as an excuse to make a puppy card! This is an A2 card using innocent pink. The sentiment and paw prints are stamped in black! I colored the paws in light brown. The twine I used on the top reminded me of a chew rope! What do you think of my samples? Leave a comment below, then stop by and see a few others by amazing designers! You will be in the running for a $50 gift certificate! Wahooo! Buy a white gel pen!